Diane Duane’s first novel, The Door into Fire, was published in 1979 and earned a Campbell Award nomination. Since then, Ms Duane has published forty novels, numerous short stories, and various comics and computer games. She lives in Ireland and is married to author Peter Morwood. Read excerpts of Diane Duane‘s novels at her website. Young Wizards — (1983-2016) Ages 9-12. Publisher: Something stopped Nita’s hand as it ran along the bookshelf. She looked and found that one of the books had a loose thread at the top of its spine. It was one of those So You Want to Be a… books, a series on careers. So You Want to Be a Pilot, and a Scientist… a Writer. But his one said, So You Want to Be a Wizard. I don’t belive this, Nina thought. She shut the book and stood there holding it in her hand, confused, amazed, suspicious — and delighted. If it was a joke, it was a great one. If it wasn’t… ? 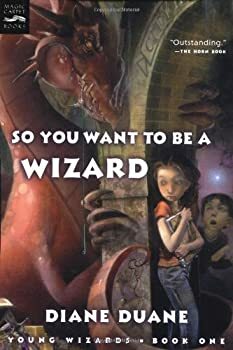 So You Want to be a Wizardcame along well before the current trend of young fantasy so one shouldn't dismiss it as "yet another Harry Potter follower." Wizard centers on 13-yr-old Nita, a picked-upon young teen, and 12-yr-old Kit, another lonely young teen. Nita, taking refuge from bullies in the local library, stumbles across the reference book providing the title of the novel and into the world of wizardry. Shortly afterward, she meets up with Kit, who himself has just become a wizard. The Wizard's Dilemma continues the story of Nita and Kit, young wizards at work. If you haven't read the others, you should. Though one could get through this and the others without prior knowledge, lack of background knowledge robs the reader of the full impact of the story. 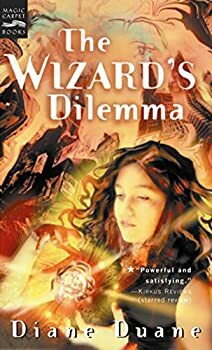 The Wizard's Dilemma is a darker, more personal book than the previous ones, which is made quickly clear when Nita's mother is diagnosed with cancer. As one might expect, Nita turns to wizardry for a solution (as does Dairine). And as one might expect from Duane's nuanced and depth-ridden series, the solution is nowhere so easy. 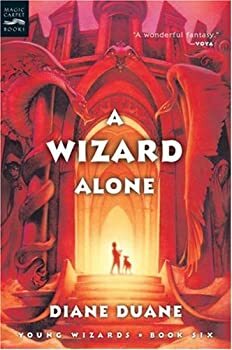 A Wizard Alone is yet another Young Wizards book that maintains the high level set by the first few in the series. While not quite as dark as the previous one, where (and if you haven't read Wizard's Dilemma then quit reading this review if you don't want the end spoiled) Nita' s mother dies, A Wizard Alone maintains a level of solemnity appropriate to what has come just before. Games Wizards Play is the tenth book in Diane Duane’s YOUNG WIZARDS series, and while a reader could struggle through it as a standalone, I’d say it’s definitely best read in the series, as there are many references to past events, a host of characters big and small and lots of terminology that will resonate more fully to fans of the series. As far as where it stands in that series (which I highly recommend, BTW), I’d say it’s one of the weaker books, though it does advance our main characters’ lives — both their wizardly ones and their personal ones — and set us up for future adventures. Omnitopia — (2010-2011) Publisher: A near-future techno-thriller from New York Times bestselling author Diane Duane. It’s the first quarter of the twenty-first century, and “massively multiplayer” on-line games have been around for a couple of decades. In an increasingly wired and computer-friendly world they’ve become a form of entertainment so popular they’re giving television and films a run for the money. And the most popular gaming universe of all is Omnitopia, created by genius programmer Dev Logan. For millions of people around the world, Omnitopia is an obsession, a passionate pastime, almost a way of life. Omnitopia is a virtual place where dreams come true-players can create their own universes within the game’s structure, and participate in the profits if their piece of the universe is a hit. Ten million players routinely play in Omnitopia, and at any given time, nearly a million of them are on-line, living in a world more real to them then their own. Worldwide, Omnitopia is now as much a culture as a game. Participants can become involved in it in a hundred different ways. Some game as if their lives depended on it, spending thousands of hours, or thousands of dollars, or both, on quests in search of “game glory” among their fellow players. Some game only to acquire sufficient in-game “value” to become entitled to become subcreators themselves, able to build new levels and start raking in the so-called “one percent of infinity” which is the leveler’s share of the profits. But there are also people who don’t game at all, preferring to use the massive platform simply to explore its worlds, or to interact with other participants. Some people do nothing but design on-line weapons and other items for Omnitopia gamers, and sell them-or act as brokers, buying and selling game artifacts to order. Some subcreators do the same kind of design and creation, but for tailored Microcosms or slices of them: these are the “unreal estate” dealers. Some players speculate in game “gold” on the success or popularity of Microcosms, rather than actually playing in them. And of course there are thieves and swindlers, cheaters who live to find the loophole in the game that will outside it in the real world. Now Dev and his people are preparing to rollout a major new expansion to the Omnitopia system. And even as players, staff, the media, and the heavy hitters on the world financial scene wait eagerly for this fast-approaching and momentous event, there are others preparing to play a very different game-one that is meant to strike at the heart of Omnitopia and bring the entire system crashing down…. 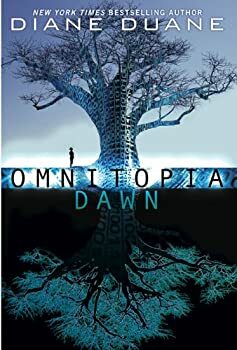 Omnitopia Dawn is the start of a new series by Diane Duane, who is probably best known for her excellent Young Wizards fantasy series. 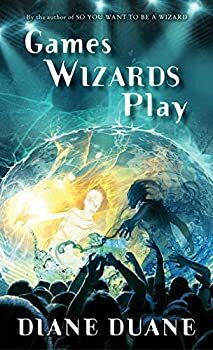 Young Wizards has always been a fantasy with some science-fiction underpinnings, but in Omnitopia Dawn Duane reverses that balance, giving us a near-future science fiction tale with some fantasy possibilities. It’s mostly a fun read, though I don’t think it so far matches the quality and depth of Young Wizards. The Tale of the Five — (1979-2001) Publisher: Herewiss, Prince of the Brightwood, is the only man in centuries to possess the Power of the Flame, but he cannot use or control it—not even to help his dearest friend, Freelorn, the exiled Prince of Arlen. Herewiss faces a devastating choice. Shall he join Freelorn in his fight to regain his kingdom? Or shall he abandon his friend to seek out the ancient castle where doors are said to lead to other worlds, worlds where, perhaps, he can learn to control the Power that burns within him. Space Cops — (1991-1992) With Peter Morwood. Publisher: Solar Patrol — Elite champions of justice in a lawless galactic frontier. The Feline Wizardry Sequence — (1997-1998) Young adult. 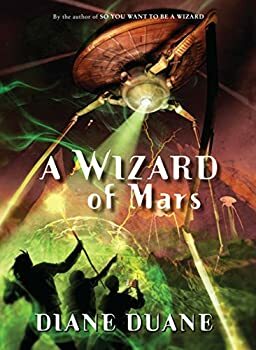 Diane Duane says these novels “are offshoots of the Young Wizards series, taking place in the same universe, and with the occasional crossover of characters from the older, larger series. In the YW universe, it’s understood that wizardry is sometimes offered to Earth-based species besides humanity if they are either intelligent enough, or just high enough up their local food chain. Cats qualify on both counts: any animal smart enough to routinely get humans to give it food for nothing will plainly have no problem mastering wizardry.” The second novel was published as On Her Majesty’s Wizardly Service in the UK. The third novel, The Big Meow, is available to read here. Publisher: Rhiow appears to be a pampered New York pet cat, but in reality she is a wizard, working alongside human beings and other animals to protect the world from the forces of darkness, which are attacking the city via the underground tunnels. The third novel, The Big Meow is available to read online here. X-Com: UFO Defense — (1995) Publisher: Commander Jonelle Barrett is determined to win. Having moved from Morocco to a new base in Switzerland, she is well-placed to build a fortified base and defend Europe from the marauding aliens who harvest humans as lab animals for breeding stock… and for their dinner tables! Barrett soon finds that her new territory is already riddled with alien invaders. Her handpicked garrison is all she has—until she learns that one of her most trusted people may be a traitor. Her task is twofold: keep the aliens at bay and keep her own sanity in the face of despair. She doesn’t know which will prove more difficult. Stealing the Elf-King’s Roses — (2002) Publisher: In an alternate-world Los Angeles, prosecutor/psychic Lee Enfield and her partner, Gelert, investigate the murder of an elf. They soon reveal a deadly network of ties among organized crime, multinational corporations, and planetary governments of the Seven Worlds — all working together on the “ethnic cleansing” of elves from the alternate world of Alfheim.